No doubt about it — something was happening in the back room of the Saturn Bar. While bursts of hammering did not disrupt the clubhouse atmosphere of the legendary 9th Ward repository of exotica, curiosity seekers did occasionally stroll back to see what owner O'Neil Broyard was up to. "Whatcha doin', Neil? Installin' insulation?" asked a red-faced man in white overalls. "Nah," replied the owner from atop a homemade scaffold. "This is gonna be a mezzanine art gallery. That's why I got extra help at the bar. I been tryin' to work on this art gallery all afternoon." 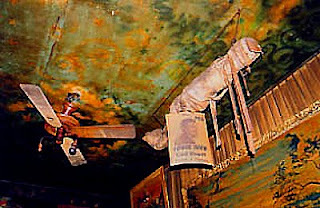 The elderly woman seated on the easy chair under the dusty mummy and the ceiling fan cocked a quizzical eye in the direction of the sporadic activity. She surveyed the sheets of Masonite stacked against the wall under the aging racehorse portraits and stuffed animal trophies, then returned to reading her newspaper under the yellow light of an old floor lamp. The smoky light inside, a pleasant reprieve from the unshaded glare of St. Claude Avenue, dimly illumined the life-size mummy, the stuffed animals and a profusion of other curiosities. In the center of the ceiling Is a large, spray-painted replica of the planet Saturn, surrounded by Halley's Comet and the rest of the cosmos. 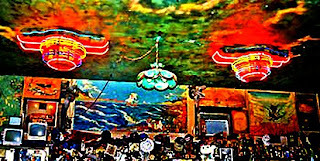 Also on the ceiling, over the bar, are two very elaborate neon light fixtures — examples of science fiction futurism, dating from the late 1940s. Hanging on a post above a defunct grandfather clock is a stuffed giant sea turtle whose shell is adorned with a tracery of pink neon. Across its back is the inscription "Candy." Such things inevitably invite speculation. Now seated at a table, O'Neil Broyard explained the history of the 9th Ward institution he has presided over for the last 20 years, and which has recently become a haunt for out-of-town visitors and members of cafe society, in addition to the regular crowd of neighborhood working people. It seems that the bar's previous owner christened it in honor of the Saturn Booster space project at Michoud. But it was the vision of Broyard — with the help and encouragement of Mike Frolich, his life-long artist friend and former 9th-Ward neighbor — that resulted in the Saturn's becoming a showcase for 9th Ward art forms. "I took over this place in '61," said Broyard in the matter-of-fact cadences of the local dialect, "and Mike Frolich was hangin' out here then. He used to be a diver, but he had a accident years ago. See, I've known Mike since I was 8 years old. His dad had a machine shop on Alvar Street. And he's got a brother who's still a diver. "Anyway, I was gettin' set to paint the ceiling and Mike says, I'll paint it for ya.' We were just horsin' around, and I never thought much about it. So next day, I get there bright and early and Mike's waiting for me to open up. So we built a scaffold and Mike and another guy from around here, Joe the Wart, went to pick up some paint and rollers. You know, it was just like out of Michelangelo. "Well, Mike starts painting the ceiling and then the two Falstaff salesmen come in and they ask, 'What you doing?' So I tell 'em and Mike takes out a little gauge and pops a line and starts painting the planet Saturn. And the guy says, 'Well, I knew he was nuts, but you must be nuts ta let him do it.' So I says what the hell. The place needs a painting — if it gets messed up, we just paint over that too. "So he went on painting the ceiling an' little by little it gets done. Finally he finished that and says 'I'll paint you some murals.' So I went and got some Masonite and cut it up, and whatever he needed I'd buy for him — brushes, paint, stuff like that. One day I add up all the slips and it turns out I'd spent $1,800 on all that stuff. See that rocket up there? Mike painted the moon mission before it even happened; he was paintin' that when President Kennedy was killed." Mike Frolich no longer hangs out at the Saturn as much as he used to because he no longer drinks. But when he does appear, he is warmly received by the regulars he has known for years. The retired diver and ex-Navy man sports the Damon Runyon demeanor and style of speech that has long caused visitors to draw comparisons between Brooklyn and the 9th Ward. Although rumors abound at the Saturn that Frolich no longer dives because he got a severe case of the bends, he denies it all and blames an old World War II injury for his retirement from work. He says that's when he took up painting in earnest and that his main motivation is to teach children the history of the world in pictures. "The Saturn Bar is the art museum for the kids of the 9th Ward," he said on a recent visit to his old haunt. "So the first painting I did was the 'Discovery of the New World' with the Nina, the Pinta and Santa Maria. Yeah, this is the children's museum of history — that's why I did the cosmos next. That's the earth and the first rocket ship to the moon ... But the sun needs to be cleaned. And there's Halley's Comet. And that picture up there is to give you some idea of how big the sun is compared to the earth," he said, pointing to a bright yellow disc with a tiny dark speck alongside. "That's done to scale. See, it's 11 million miles in diameter--ain't nothin' but a speck." The next painting in Mike Frolich's fanciful personal odyssey, his picture history of the world and its inhabitants, was a multicolored scene depicting a horned creature and a woman astride a dragon soaring over a sulfuric wasteland of volcanoes and smoke and sooty flames in strange colors. "That's the devil takin' a prostitute to hell," he said. "What came next is 'Poverty'," he continued. "I did this for the kids. And then the next one was 'Progress,' " he said pointing to a picture of a big car, the Mississippi River Bridge, and the city surrounded by oil wells. Other paintings at the Saturn by Frolich include the "Theory of Relativity," which incorporates some rosary beads "blessed by Father Rogers," Frolich is quick to note. "It shows how we are all atomic energy. A lot of my paintings are blessed by the priests—I'm proud of that. And that's 'The Irish Sweepstakes.' And over there is one I made for Neil's mother, that's Bernadette giving Fatima a rose for Mother's Day." Frolich, who is the grandson of a German architect who helped build St. Joseph's Catholic Church on Tulane Avenue, concluded his survey with a picture titled "Not Guilty." "That's the devil," Frolich explains. "He's a personal friend of mine. 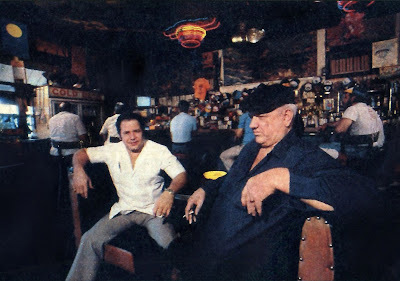 He cost me a lot of money, so I put him in heaven." 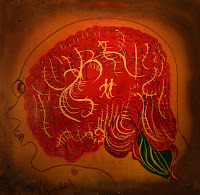 Frolich's explanations of his art shed much light on the secrets of the Saturn Bar. But the giant turtle with the legend "Candy" across the back of its shell remained a lingering mystery—until O'Neil Broyard revealed the inside story. "Let's see," he said, eyes distant in reverie. "I bought him off a seafood truck for $4 or something like that. He was walking around here for some time, but it wasn't right, you know. Turtles don't usually live in bars, and the floor was hard on his feet. So I had him stuffed and mounted. "Well, about that time, the salesman from the beer company and me got into a fight. Called me a liar. So I got rid of their sign outside, and had my own neon sign made — that's when I got the idea to put neon on the turtle. So they took the turtle to the Industrial Sign place — cost me $149 dollars then. Today it would cost $500 to put neon on a turtle like that." 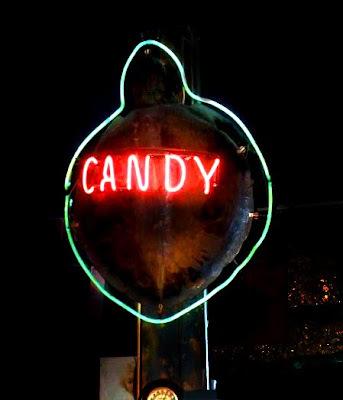 But why the inscription, "Candy?" "Well I used to book," Broyard said. "And when they'd lose the bet, I'd say, 'It's like taking candy from a baby.' So that was like my motto, you know? That's why it's written across the back of the turtle." 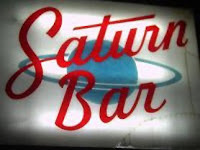 At the Saturn Bar, such stories are so commonplace that they are normal, accepted without hesitation. Its secrets lose none of their mystique merely for being revealed. It's that kind of place.